These guys are possibly my favourite unit so far. Great sculpts, easy and fun to paint. Thoroughly enjoyed getting them done. I have a second unit I'll upload a picture for tomorrow. 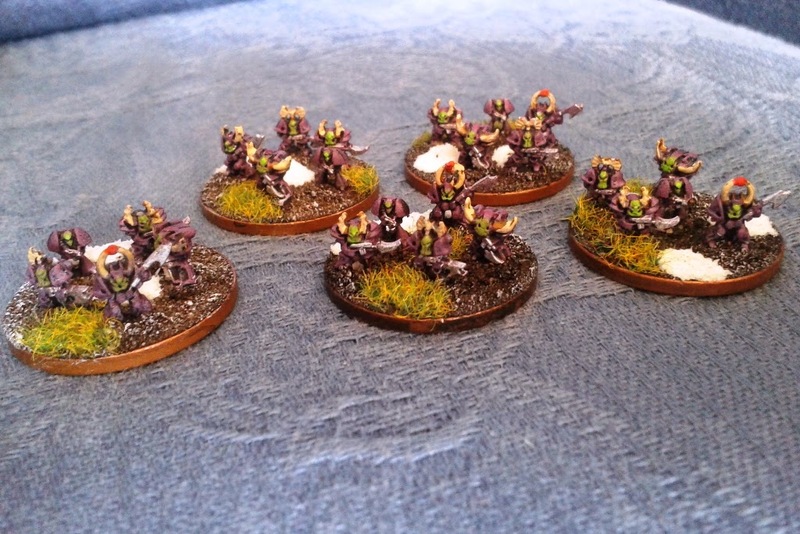 This is the final instalment in my trilogy of mini-posts about Epic scale Chaos Marine Tactical Squads. The keener-eyed among you might notice that one of the Marines on the left-most stand is facing the wrong way. After I glued him on with super-glue, I didn't notice but he "floated" a little and altered his position. My final detachment doesn't spell an end to working on Chaos Marines - I've got three detachments of "Havok" (Devastators) to do too. I'm going to have a break from Marines though and work on some of the more esoteric units in the army. Next up will be Trolls. Yes, you heard me right - Trolls. 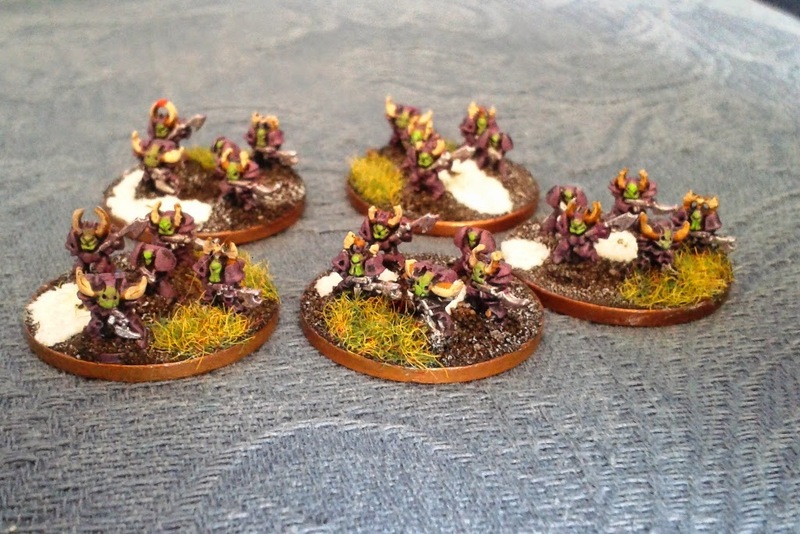 Here's the second instalment of my 3-part drip-feed on my Chaos Space Marine Tactical Squads. I have to say I'm loving working on models at this scale. It's folly to try and go overboard with details, I think. That said, with a simple 3- or 4-colour paint-scheme and some very minimal shading/highlights you can create a satisfying "unit look" in a short period of time. Here is the first of my three detachments of Tactical Chaos Marines. I ran short of Chaos models whilst building these, so each stand has one shifty-looking Imperial Marine on it to make up numbers. Some of the horns on the helmets were damaged whilst removing them from the sprues. Call it "battle damage". Can you spot the Imperial Marines? I'll upload the other two detachments as separate posts over the next couple of days to keep things ticking over whilst I'm working on the next units. My blogging rate on this project has been lower than I'd like and some upcoming time off is going to do nothing to improve that, so I thought I'd get a quick WIP update posted to keep things rolling along. At the moment I'm working on preparing a full Company of Tactical Marines for the Epic Chaos force. For those who have forgotten how that works, that's 3 detachments of Marines (each detachment being 5 bases of 5 marines) and a Command base. So to that end, I've been painting Tactical Marines. 75 of them. Not as big a challenge at this scale as it would be at 28mm, but the painting itself is more fiddly. As you can no doubt see from the photo the guys with the missile launchers aren't painted yet. 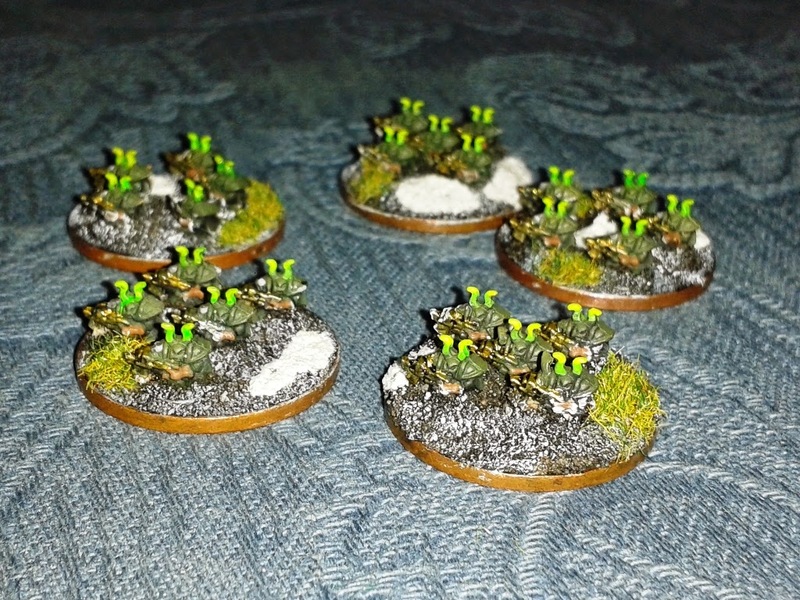 I'm going to use a small number of them as troops on the Command bases, but as they're posed sideways on on the sprue I decided to leave painting them until I'd removed the other models and could work around them a bit more easily. 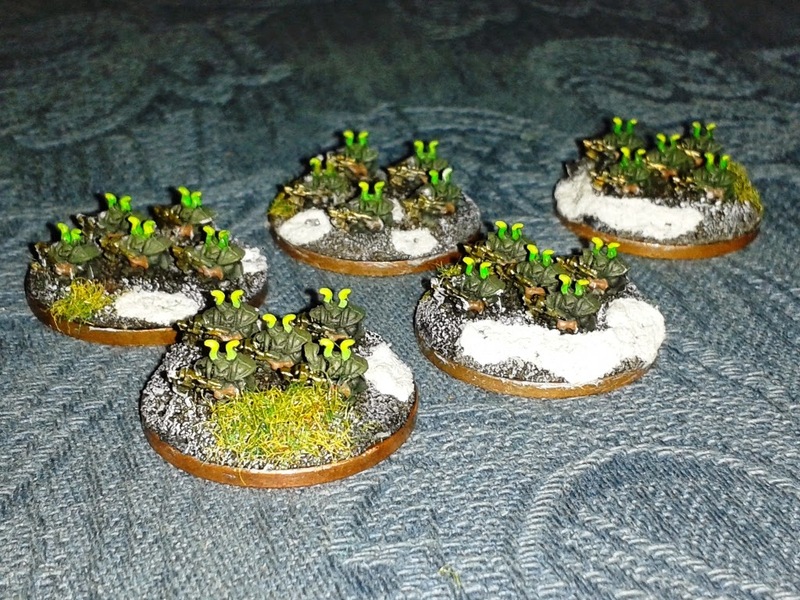 And for my next unit: Raptors (a.k.a. Chaos Assault Marines). Trouble is, I don't have any Raptor models. 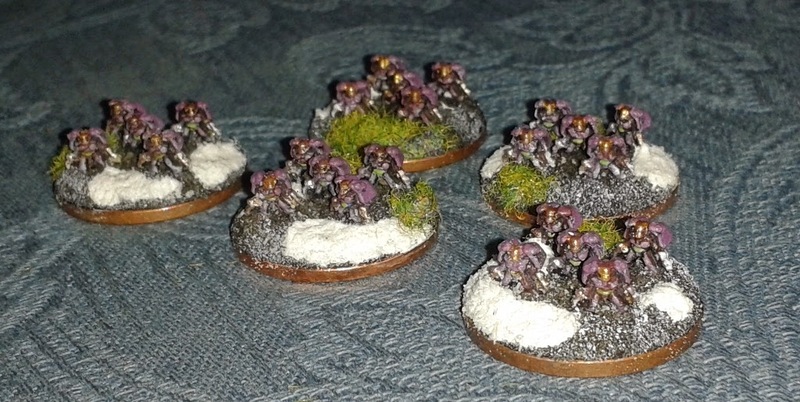 So I used some Imperial Guard with jump packs (yes - the Guard used to have jump packs back in the day). And another troop-type is complete! 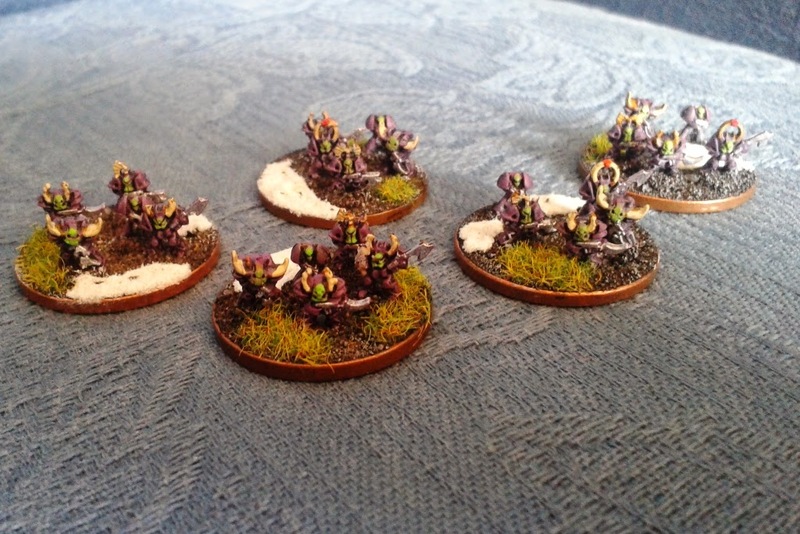 This time five Fleshhound stands. 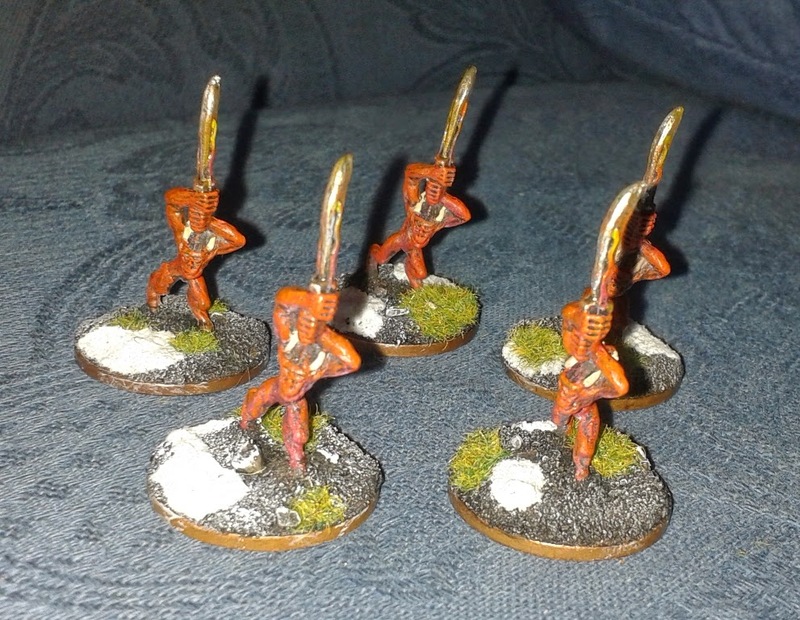 Like the Bloodletters I did last week, these guys were (for some reason) sculpted by Citadel way-off-scale, but you can only work with the models you have (unless you're good with Green Stuff, which I most definitely am not). These were simply sprayed black, then drybrushed white. I then drybrushed (from top down) with yellow, then orange, then red, then went back to the top of the models again and drybrushed a little more white. I then gave the whole thing a red ink-wash. (I wanted a light-to-dark red gradient from top to bottom - I think it worked OK). I picked out the ridge of horns down the back with brown, highlighted in bone and picked out the teeth in bone. 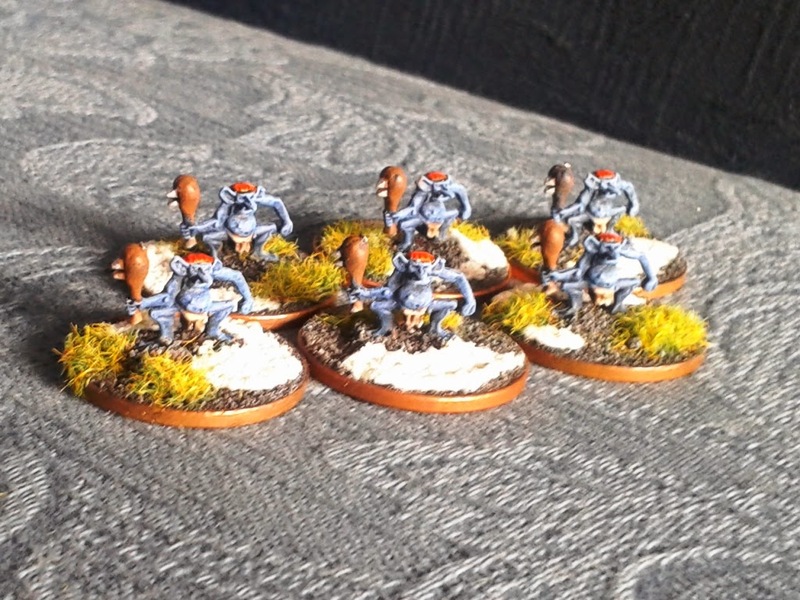 Here is my first unit of "man-sized" troops for my growing Epic Chaos force. I'm painting these up as the whim takes me - there's no particular order to what I'm doing (which might explain why I haven't yet painted any Marines for my Chaos Marine army). I'm keeping the colour scheme minimal on this army as there's not enough room on the models to do much else. Not that they're lacking in detail (they're not) but too many different colours would just look silly. So - they were spray basecoated in black, then given two layers of airbrushed colour (olive green and dark yellow) from above. The gloves and belt-pouches were picked out in brown, the guns in gold (and then given a brown ink wash) and the helmet horns painted with Citadel "putrid green" and highlighted with "bilious green". Another Chaos unit completed. Bloodletters this time. 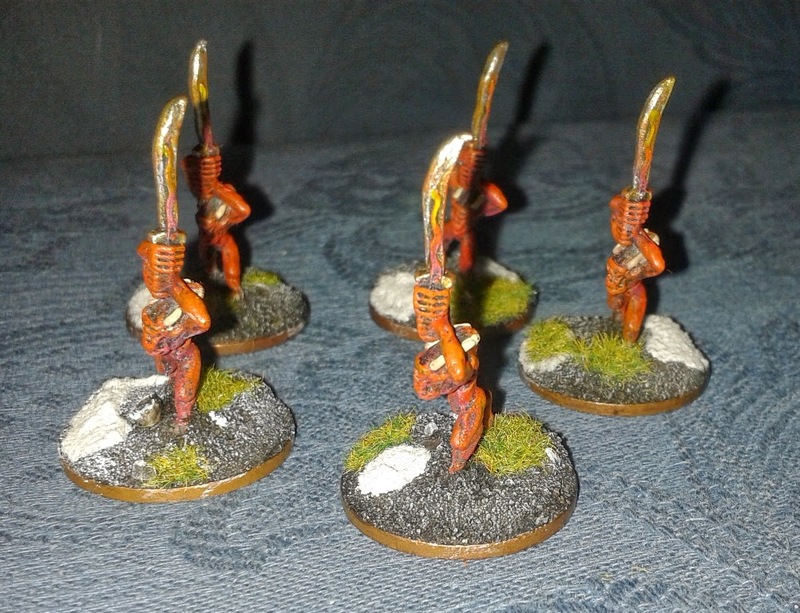 I only have one unit of these and these are the original metal models produced before someone in GW realized "hang on - aren't they a bit on the big side?". I think Bloodletter models for Epic were later recast to be to the proper "5 models on a same size base as shown above".